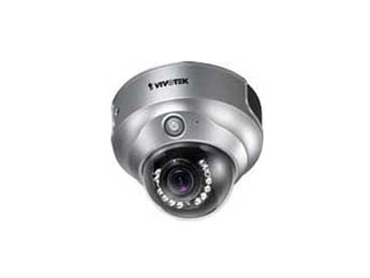 Available from Kappalyn Technology Solutions , Vivotek FD8161 day/night fixed dome network cameras feature a 3-9mm vari-focal auto-iris lens and removable IR-cut filter for day/night function. They also feature built-in IR illuminators up to 15 metres, providing greater clarity and contrast 24 hours a day. These network cameras are especially suitable for wide open spaces such as building entrances and airports. They are also suitable for applications that require accurate identification of human faces or license plate numbers. Vivotek FD8161 cameras support the latest in H.264 compression technology, effectively reducing file sizes by up to 90%. They also feature a cropping function that removes unnecessary information and only transmits the designated image to optimise storage usage and bandwidth. Additional information on Vivotek FD8161 day/night fixed dome network cameras is available from Kappalyn Technology Solutions.